[putting on her best Sally Struthers “Save the Children” voice] Picky eating affects nearly every one of us. Whether you’re a picky eater or know someone who is, we can all do something to help. No, really. How many of us have never been or never dealt with a picky eater in our lives? I don’t see too many hands. Apart from the fact that I’ve known and adored Stephanie V.W. Lucianovic for years through her pithy writing on Grub Report and Television Without Pity (yes, Top Chef fans, you can all thank her for coining the word “cheftestant”), I had to get a copy of her new book, Suffering Succotash: A Picky Eater’s Quest to Understand Why We Hate the Foods We Hate . Not to throw my husband under the bus yet again, but after more than a decade of trying to figure out why Dan out-and-out rejects most foods I consider staples—from lobster rolls to hot dogs to omelets to Thai food to guacamole to soup and any other hot liquid (no coffee, no tea, not even hot chocolate, really! )—I needed Stephanie to give me some answers and, with any luck, a game plan for changing Dan into an omnivore. As a picky eater turned foodie, Stephanie draws on a lifetime of food trauma (terrorized by pudding skin, freaked out by the smell of spinach) to try and figure out why we become picky eaters, and how we can overturn our food phobias and stifle our gag reflexes to embrace the world’s full spectrum of tastes. It’s not as simple as discovering whether or not you’re a supertaster (sorry, Dan), but both picky and adventurous eaters will identify with Stephanie’s quest and be satisfied by the conclusions she draws. Stephanie challenged my own picky eating phobias (yes, I have them—witness my screed against bananas) with a recipe for butternut squash pasta. Squash, like pumpkins, is what Stephanie calls a “texture violation” for my palate: it’s like weirdly stringy, fleshy baby food. 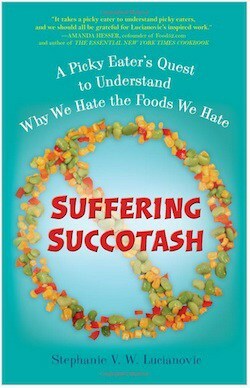 In one of Suffering Succotash‘s chapters, Stephanie relates a highly traumatic story of being forced to down an entire plate of cold, maple syrup-y acorn squash, and reading that tale sent tremors through my stomach. 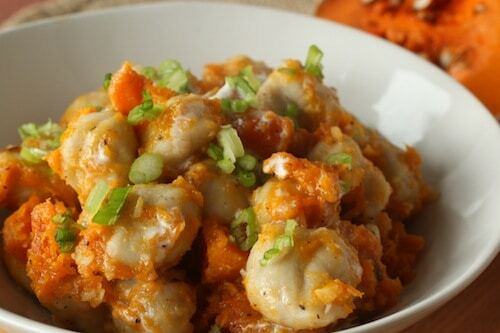 Toss the cubed butternut squash with the olive oil, coriander, cumin, red pepper flakes, salt, and pepper. Pour the squash into a large ovenproof baking dish and scrape any remaining oil and spices onto the squash with a spatula. Cover the dish and roast for about 45-50 minutes until the squash is very soft. Uncover the dish for the last 10 minutes of the roasting process to bring out a nice, toasty color in the squash. While the squash cooks, bring a large stockpot of water to a boil and add 1 tablespoon kosher salt. Cook the gnocchi until tender, then drain and reserve. Splash the gnocchi with a little olive oil to keep them from sticking together while they wait for the sauce. Remove the squash from the oven and stir in the miso, garlic, and ginger while the squash is still hot. (This allows the residual heat of the dish to cook the garlic without burning it bitter.) If the squash cubes aren’t fully breaking down, mash with a potato masher or fork until they dissolve into a sauce. Add the cooked pasta to the squash “sauce” and toss gently until fully coated. Drizzle the crème fraîche over the pasta and garnish with the scallions. Serve immediately.